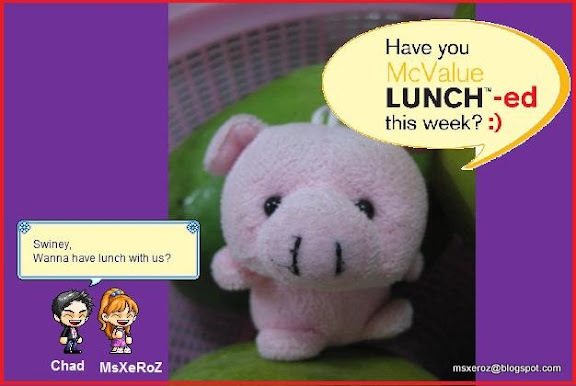 MSXEROZ:::Stories of My Life:::: Have You McValue LUNCH-ed This Week? One fine day, when threads of destiny began to untangle. 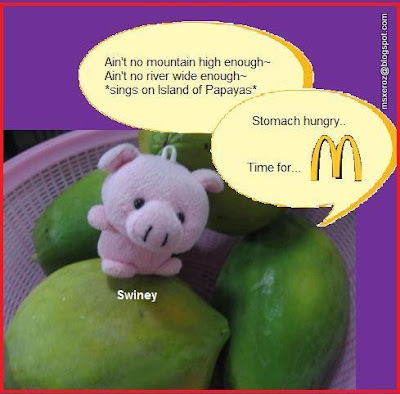 On the other side of the world, lies Swiney da Swine lying on the Papaya Island.. Wait a minute! Hey!!! You look familiar! Swiney: Who me??? Oh..I'm kinda famous lately..Want my autograph? 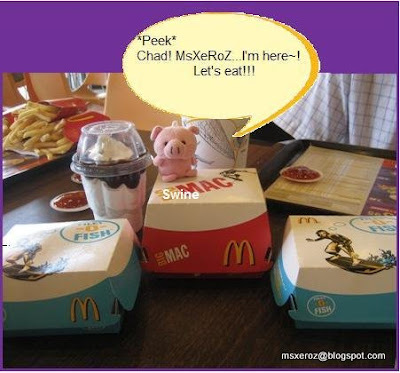 Chad and MsXeRoZ went to look for their long lost pink-coloured buddy, Swiney! 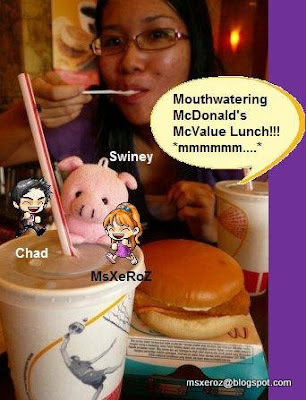 What's so great about the McValue Lunch??? Despite the fact that the three of them had no driving licence, they managed to reach McDonald's safe and sound..
Every thing in McDonald's seems perrrfect! 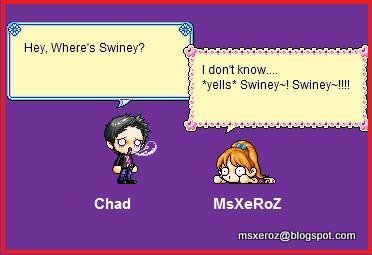 Chad and MsXeRoZ were too excited to notice that Swiney has disappeared! With their stomach hungry, they felt devastated! Swiney, where have you been? Suddenly, a soft, distant voice called out to them.. Swiney!!! There you are! You made us worried!!! Swiney has been an avid traveller. He had just conquered the Broga Hill, and now.. 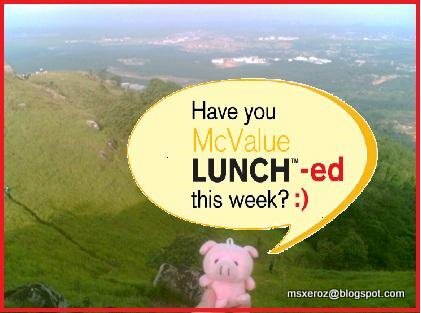 He conquered McValue Lunch! I'm Loving It at McDonald's... It's a place where fond memories took place. 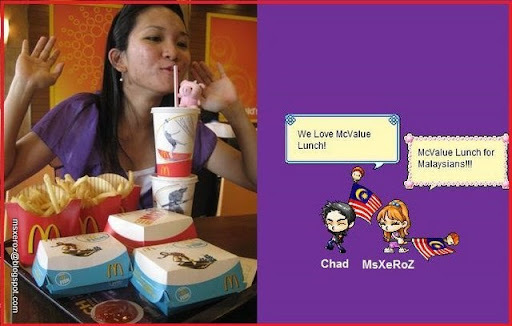 With the Super Duper McValue Lunch Deal~! You can reward yourself with Chocolate Sundae! Can't help..Falling in Love.. With... McDonald's! 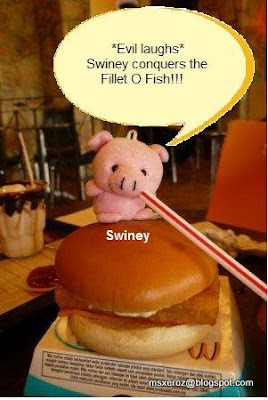 Hey..Swiney had conquered my Burger!!! Note: No animals are harmed in the making of this post. 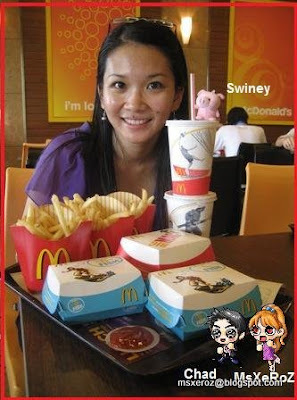 uh...swiney join the crowd..will Mc D restaurant is safe to eat..LOL? Just kidding..nice blogpost anyway..
cool! i bet editing the picture is hard adding avatars. cool sequence. idid participate too.hehe. After reading the .. erm ... story, I have only 3 words for you my dear. OMG! 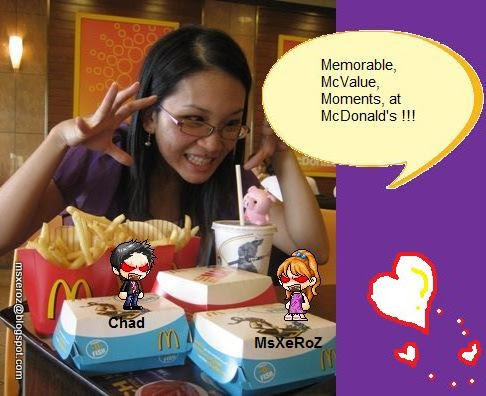 cute..cute..;-0 feels like wanna have mcd now, lol! Wow~! Thanks for all the comments! 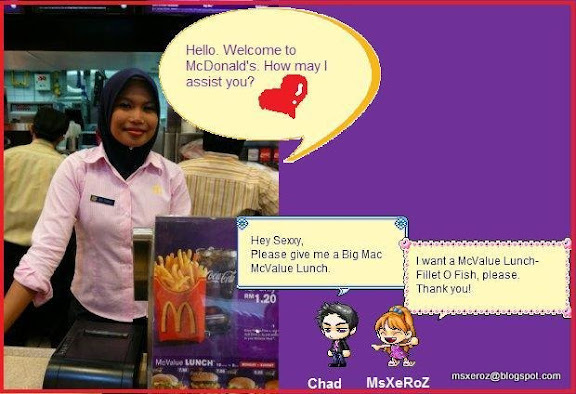 i thought McDonalds was supposed to be halal.